Valentine’s Day is just around the corner. It is time to step up your game and give your sweetie something fun and creative. A Valentine’s Day Flip It Book by sminto is just that gift! Don’t be afraid to try your hand at this tutorial. It is a simple process that anyone can do. Remember making those little flip books in grade school? This is the same concept, only with a video instead of drawings. 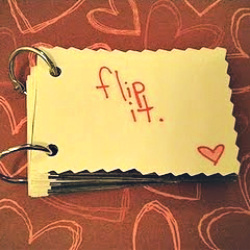 A Flip It Book will be a wonderful memento that your special someone will keep for years. It also is a romantic way to propose. Show your sugar that you care with inspiration from our Valentine’s Day Board. We have tutorials that will knock their socks off! Have a smoochy Tuesday!